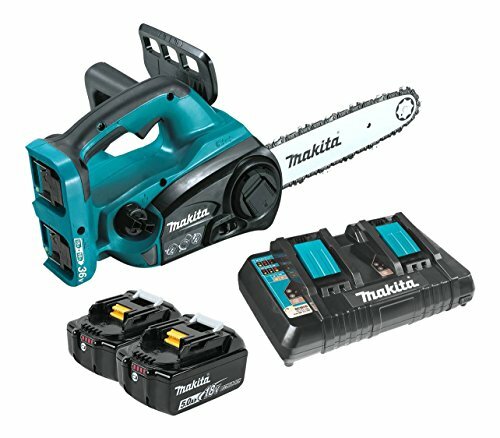 The 18V X2 LXT Chain Saw (model XCU02PT) is powered by two 18V LXT batteries (included), so you get 36V performance and run time for corded and gas-powered demands, without leaving the 18V LXT platform. Model XCU02PT is a kit and includes two fast-charging 18V LXT 5.0Ah batteries and an 18V Dual Port Charger that will charge two batteries simultaneously for increased productivity and less downtime. The XCU02PT Chain Saw has a 12” guide bar and the Makita-built motor delivers 1,650 FPM for increased cutting speed, but with less noise. Additional features include a “tool-less” chain adjustments, a front hand guard engineered to actuate chain brake when engaged, an electric brake for maximum productivity, and more.